In Passengers, a pair of normal people find themselves in an extraordinary situation. On a 120-year journey to Homestead II, an Earth-like paradise not yet overpopulated by humans, Jim Preston (Chris Pratt) and Aurora Lane (Jennifer Lawrence) awaken from their slumber just 30 years into their trip. This leaves the two hapless voyagers stranded on the spaceship, still 90 years from their destination. The marketing for Passengers has been crystal clear: It’s a love story. After my screening a few weeks ago, I overheard someone refer to it as “Titanic in space.” But, make no mistake, there’s something much more sinister about the film the marketing has failed to tell you. When audiences find out what’s really going on in Passengers, I’m not sure they’re going to like what they see. If you’ve read the script, which has been on Hollywood’s famed Black List for a few years, then you already know what happens. If all you know about Passengers is what the trailers have shown you (as I did), it’s difficult to talk about the movie without really jumping into spoiler territory. While this review won’t spoil the entirety of the film, there is one key moment that I will discuss, which happens pretty early on. Warning that there are some moderate spoilers ahead. Unfortunately, there’s no way for Jim to go back to sleep; the pods require special tools in order to do that, which Jim doesn’t have—it’s not like he doesn’t try. He realizes, along with the audience, that he’s going to die on that ship, alone; it’s heartbreaking to watch as he grapples with his fate. After accepting the Avalon as his permanent home, Jim tries to make the most of the situation, and it’s here when Passengers is at its best. 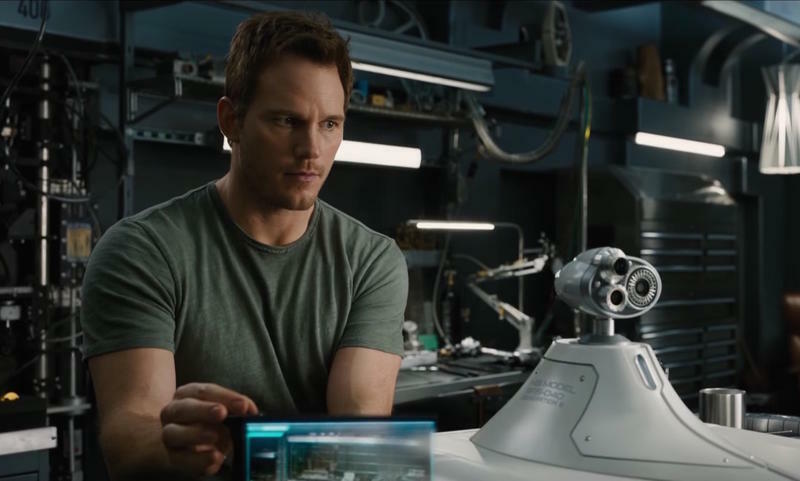 Seeing Jim go from confusion to anger to sorrow is fascinating, and Chris Pratt is more than up for the challenge. But after a year of being alone, the isolation gets to be too much, which leads Jim to his first big decision: Go on or end it all? Jim decides to end it all, but on the brink of suicide, he changes his mind and sullenly walks back through the ship’s hull, where he comes across Aurora, who is still sound asleep in her pod. This is where the film takes a drastically different turn. It’s a love at first sight moment for Jim, who quickly begins to learn everything he can about Aurora. (There are apparently passenger logs that allow him to find out who she is, where she’s from, etc. Privacy alert.) He pines over her, thinks about her. When talking to ship’s humanoid bartender Arthur (Martin Sheen), he won’t shut up about her. That brings Jim to decision number two: Wake Aurora up or let her be? This where Sony’s marketing can be a bit misleading, treating Passengers as if it’s some grand love story about persevering against the odds. Rather than dig deep into the terrible kidnap fantasy in Jim’s mind, the film’s story attempts to make Jim and Aurora’s romance its central focus. Once Jim wakes Aurora up, the film switches into full-on romance mode, even though the audience knows full well that Jim had just, for all intents and purposes, sentenced Aurora to death. What would Jim have done had Aurora not liked him? I would have much rather watched that. Yet, we spend the next 45 minutes or so watching as the two go on dates, consummate their relationship, and have a ton of fun. Good job, Jim. Well done. Aurora eventually finds out Jim’s dark secret, a scene Jennifer Lawrence delivers fantastically well. But the movie handles the aftermath of this revelation poorly, ignoring the complexity of the situation by focusing on how badly Jim feels. We follow him as he mopes around the ship, talks to Aurora over the PA, and otherwise feels terrible. The movie desperately wants the audience to feel sympathy for Jim—until you’re reminded that he’s just a guy who happened to walk by her pod when she was sleeping. Watching Passengers, I’m reminded of 10 Cloverfield Lane, which had a somewhat similar captor/victim arc. In that film, Michelle (Mary Elizabeth Winstead) is “rescued” by Howard (John Goodman), who turns out to be a homicidal maniac. It’s a terrifying, thoughtful thriller that examines the abusive fantasies of a selfish man. Jim, of course, isn’t quite as sinister, but Passengers spends so much time focusing on making their romance work that it skims over Jim’s terrible, horrible, no-good decision. When we should be examining how isolation could and does test our limits as humans, the movie is more concerned with whether or not Jim and Aurora make a nice couple (they do). Against all odds, I’d still see Passengers when it comes out on Dec. 21. Chris Pratt and Jennifer Lawrence are electric on screen together, and the film is gorgeous. There are several scenes when the backdrop of space comes to the foreground, and it’s impossible not marvel at the passing scenery, like when the ship comes dangerously close to a galaxy’s parent star. The Avalon, meanwhile, is wonderfully conceived, like a luxury cruise ship of the future. The action set pieces are incredible, too. I forgot to mention that as Jim and Aurora’s relationship falls apart, so too does the Avalon, a result of it being clobbered by space rocks the year Jim woke up. The two then must figure out how to fix the ship, aided by the sudden arrival of Chief Gus Mancuso (Laurence Fishburne), who conveniently has access to the places in the Avalon Jim and Aurora did not. I won’t tell you how it ends because it’s spectacular to watch on screen. Passengers tries to be one movie when it should really be another. It’s not like Jim and Aurora’s romance is unconvincing; on the contrary. But it’s how the movie approaches their romance that doesn’t quite stick. It never fully extrapolates the answer to the question it brings up early on. If you were stuck on a ship by yourself and had the opportunity to wake someone up, would you?